Veggie burgers come in a number of varieties, and they can be lower in fat and cholesterol than burgers made of meat. Depending upon the burger and your palate, they are also quite tasty. While each veggie burger contains a different number of calories and amount of protein, familiarizing yourself with some basic calorie and nutrition guidelines can help you fit these convenient foods into your diet. 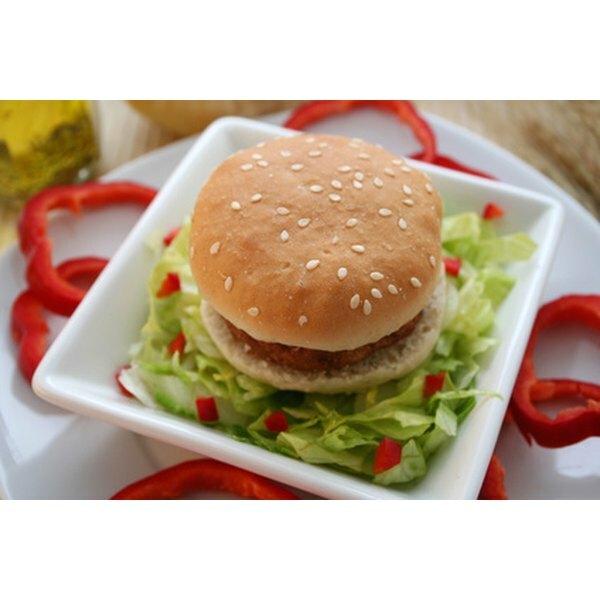 Veggie Burger Patty has 127 Calories and 24.05 g of Protein per 100 gram serving according to the nutrition facts provided by the USDA Food Composition Database. Veggie burgers can be made from a variety of ingredients, including grains, vegetables, legumes or soy protein, according to registered dietitian Karen Collins at MSNBC.com. Vegetarian burgers bought at the grocery store are typically cooked in a hot skillet, while homemade ones may be baked, pan fried or even deep fried. The ingredients in the burger and the cooking method will impact fat, calories and nutrition content. Most purchased, frozen veggie burgers weigh approximately 2.5 ounces, according to FatSecret. A serving consists of one veggie burger patty. Depending upon the brand you choose, a patty will have between 70 and 170 calories, according to MSNBC.com. A standard meat burger weighs 3 ounces, but larger burgers or multiple burger patties are not uncommon. Veggie burgers have zero to one gram of saturated fat per burger, while even a low-fat beef burger has three to five grams. Reduced saturated fat and increased fiber are keys to a healthy diet, according to the American Heart Association. Look for a reduced sodium burger if you have a lot of processed foods in your diet. A veggie burger high in iron and vitamin B12 is ideal for vegetarians, according to MSNBC.com. Packaged vegetarian burgers provide nutritional information. Compare burgers on your store shelves to choose one that best fits your needs, then try a variety to find one you like the best. If you are making veggie burgers at home, use soy or legumes like black beans for protein, and bake rather than fry the burgers. Keep the burgers small to reduce the total calories. While veggie burgers are a relatively low calorie and practical protein source, as with any burger you can add calories with the bun and toppings you choose. Select a lighter bun or low-calorie wrap and top your burger with mustard and fresh vegetables rather than mayonnaise and cheese. Opt for low-fat mayonnaise and cheese if you want them on your burger. MSNBC: Are Veggie Burgers Healthier? What Is the Omega 3 Content of Cashews?